Contact our office to inquire about an OCT at your next appointment. The VISIOFFICE® 2 provides cutting edge digital dispensing technology that delivers an accurate, precise, and consistent way to provide expert cuts for lenses. 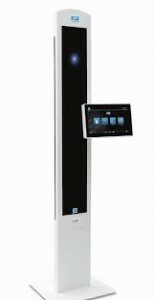 The VisioOffice 2 fits and measure lenses with measurements down to 1/10 millimeter, recording two images to create a 3D image to locate unique optical eye rotation center, and everything done with an HD imaging system. With our VISIOFFICE® 2, we’ll produce a lens that is catered to your specific facial features, head and eye movement, and particular prescription. We’ll take specific measurements in front & back of the lens & design each lens specific for you. Plus, the lens will utilize a digital surface to reduce distortions & improve peripheral vision.